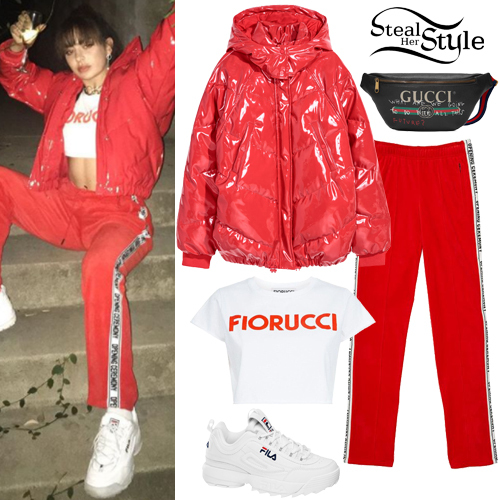 Charli XCX posted some pictures on instagram wearing the H&M Patent Padded Jacket (Sold Out), a Fiorucci Vintage Cropped T-Shirt ($77.00 – wrong color), Jewel Red by Opening Ceremony Velour Track Pants ($135.00), a Gucci Coco Capital Print Belt Bag (Sold Out) and Fila Disruptor II Sneakers ($70.00). Kendall Jenner was spotted heading to Craig’s restaurant in West Hollywood wearing a Priamo for Opening Ceremony Bralette ($588.00 – top & pants set), Yeezy Season 5 Straight Jeans ($198.00), her Louis Vuitton X Jeff Koons Leonardo Di Vinci Clutch ($1,760.00) and Yeezy Season 6 PVC Sandals ($650.00). You can find similar sandals for less at Public Desire ($44.99). Hailey Baldwin posted a picture on instagram a couple of days ago wearing Acne Studios Lore Ecru High Collar Jacket ($2,600.00), Opening Ceremony Track Pants ($150.00) and Dr. Martens Coralia Boots (€85.00). Demi Lovato was spotted out and about in London wearing a Pinstripe Mock Neck ($175.00) and Pinstripe Pants ($225.00) both by Opening Ceremony, Lana Jewelry Large Magic Hoops ($310.00) and Ego Fiona Pointed Toe Ankle Boots ($54.99). Amanda Steele attended the 5th Annual Beautycon Festival Los Angeles at the Los Angeles Convention Center wearing a Jackie Striped Laser-Cut Crepe Top ($145.20) and shorts (Not available online) both by Acne Studios, Fleur Du Mal Charlotte Lace Triangle Bra ($125.00), a Kelsey Fairhurst Small Metallic Headgear ($95.00) and Amiri Stripe Panel Hi-Top Sneakers ($690.00). 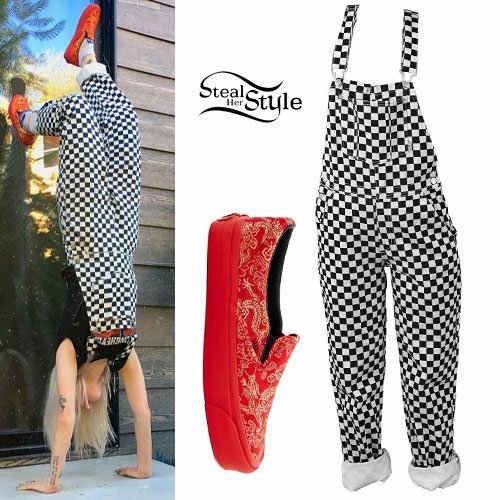 Hayley Williams appears in one of Paramore’s twitter photos from the recording studio a while back wearing the UNIF Apex Overalls ($158.00) in checkerboard printed denim and a pair of Opening Ceremony x Vans Vault OG Slip On LX “Qi Pao” Sneakers (sold out). Madison Beer was spotted leaving Fred Segal this afternoon wearing an Are You Am I Minka Top ($89.00), an Opening Ceremony OC Varsity Jacket ($395.00), Topshop Moto Stone Wash Ripped Jamie Jeans ($80.00 – wrong color), a Chanel Lambskin Quilted Backpack ($5.162,65 ) and Adidas Stan Smith Sneakers ($75.00). Sofia Richie was spotted leaving dinnet at Craig’s last week wearing an Opening Ceremony Long-Sleeve Sheer Mesh Top ($175.00), a Balenciaga Swing Shell Bomber Jacket ($2,150.00), J Brand Pull On Leather Leggings ($948.00), a Moschino Pill Pack Metallic Faux Leather Bag ($1,095.00) and Adidas Originals Stan Smith Sneakers ($74.95). You can find similar leggings for less at PrettyLittleThing ($21.00). Keke Palmer posed at Knott’s Scary Farm Black Carpet Event wearing a G-Star Arc Denim Boyfriend Boilersuit ($242.00), a Harding Lane for Opening Ceremony Rose Hat ($40.00) and Puma Court Star Crafted Sneakers ($56.00). Charli XCX posted a picture on instagram a couple of days ago wearing an Opening Ceremony Reversible Silk Embroidered Bomber Jacket ($525.00), American Apparel Interlock Running Shorts ($22.00) and Adidas Ultra Boost Knit Running Shoes ($180.00).